To be fair, I am going to start today thanking Maynor Mijangos from Galas de Guatemala, because in addition to let me use his photos, he mentioned this blog in his newsletter yesterday and as a result, this blog has two new followers and I am more excited than ever to continue guiding you through this journey. Thanks again Maynor! As I mentioned yesterday, Guatemala City is kind of an spiral and that is why the zone that follows zone 4, is the 9, which is surrounded by zone 10 (to the East), zone 8 (to the West), and zone 13 (to the South). One of the most notorious landmarks of Zone 9 is the Tower of the Reformer (Torre del Reformador) built in 1935 to commemorate the 100th. birthday of Justo Rufino Barrios, former president of Guatemala acknowledged for the numerous reformations he introduced to the country. This 75 meters steel structure resembles the Eiffel Tower, only you can drive underneath since it was built right over a crossing of roads. Originally conceived as a residential area, Zone 9 is now in the process to become a commercial one since many of the big houses have been transformed into offices and some others have been demolished to make the space suitable for large buildings. Despite this, we still can see in the area beautiful gardens, ample boulevards with trees and nice sidewalks. 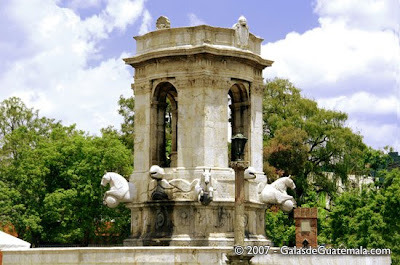 Photos in this page by galasdeguatemala.com, used with authorization. 2 cups of fresh lime juice (approx. 12 limes). Here is very important to clarify that in Spanish we call limón to the limes; I recommend you not to use lemons because the flavor is not the same. Blanche the shrimps in boiling water for 3 minutes, transfer them to a bowl with icy water to stop the cooking process. Drain well. Return the shrimps to the bowl and add the lemon juice. Let stand covered in the fridge for about 2 hours. Add the rest of the ingredients, season with salt and pepper, mix well, cover again and put it back in the fridge for another hour or so. Do not leave it in the fridge for too long as it may become soupy. Serve with plain or salty crackers and a cold Gallo beer (may be available under the brand Famosa). Cheers!